Scroll Down For Lots More! Compare us against the competition. The Pro 2 does not move when it shoots a ball unlike almost all machines on the market that use the very dated method of turning in the direction the ball will shoot. This makes the Pro 2 Random Mode (also referred to as ‘All-Court’, ‘3D’ or ‘Player’ mode) as close to hitting with a real player as possible. Inside the machine opening the throwing wheels are black and the metal-work is powder-coated black to make each shot even less predictable. Another benefit is that this design results in the Pro 2 being able to execute changes in ball direction faster than other machines. The Pro 2 can be easily controlled at the machine from the contemporary membrane touch panel with includes a 4-character backlit LCD display which displays the different settings and programs, battery life and diagnostic information. The remote control duplicates all of the same controls and also adds a ‘Snooze’ button to place the Pro2 into quieter and lower power mode which conserves battery life. We include a full-function remote control in the price because you do not want to use a ball machine without one. You would be running back and forth to the machine every time you want to change a setting. Much easier to use than a smartphone remote, the remote is the size of a credit card and feather-weight. You would not even know it was in your pocket. Settings can be changed and drills switched on the fly while the balls are shooting out or while paused. All other machines required you to pay extra for the remote. The unique remote ‘Snooze’ mode saves battery life and makes the machine even quieter while picking up balls or while someone is talking your ear off. This feature is not available in any other machine. The External Battery and AC Power Only Models are just 39 lbs. This makes them easy to lift, allow you to leave the machine in the car and bring in only the battery charge, which also takes up a lot less space. Replace batteries in an instant. The machine remains stable without the battery inside unlike some machines which advise in their manual to add a weight. To move the Pro 2 simply reverse the hopper over the machine body, extend the handle from underneath the machine and pull it like luggage. The handle neatly retracts under the machine during storage, unlike some machines where the handle sticks out on top of the machine. You can even move the Pro 2 with the Carry Case or Dust Cover on the machine. – Horizontal Oscillation Drill (Medium & Wide) with Vertical Oscillation, also known as Random Mode where the ball shoots all over the court and you cannot predict where it will land next, just like playing with a real opponent, especially since the Pro 2 does not move unlike other machines. – All above drills can be performed in horizontal or lob mode or anywhere in between (200 elevation settings). – All above drills can be performed using various degrees of spin and interval between balls. – All settings can be changed on the fly while the balls are shooting out or while paused. Note that unlike other machines you do not have to program any of this. One touch and you are into the drill. Then one touch to switch drills, change spin, elevation, interval between balls or ball direction. Having the ability to ‘program’ the machine sounds fancy but why should you do all the work? We’ve already done all of it for you! See the video above for explanations of these various programs. The wide range of ball speeds from 32kph (20mph) to 130kph (80mph) will be suitable for children, beginners, and intermediate to the most advanced players. The wide range of interval between balls accommodates beginners to advanced players. The 15 second interval can be convenient where there are 2 players practising with machine, such as one on the forehand side and one on the backhand side. 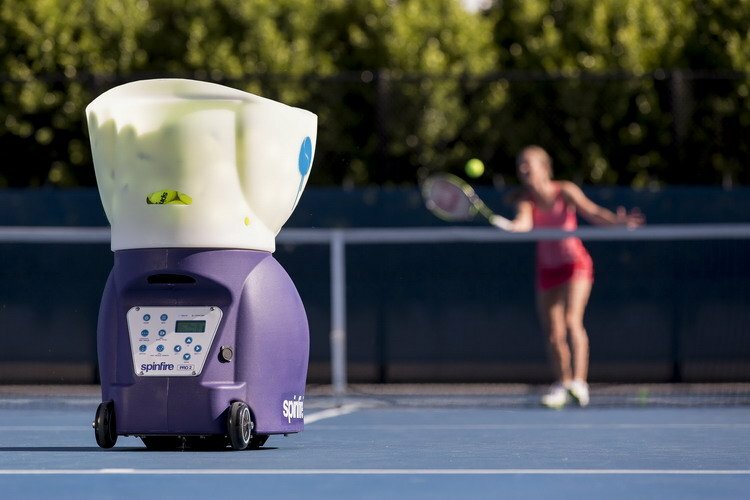 In addition, this long interval allows someone to serve a ball to you in between the machine throwing a ball. No other machine has this range of ball interval. The 10 Levels of topspin & backspin will tax even the most advanced player as the levels go up to extreme. The Pro 2 throwing wheel mechanism can oscillate both vertically and horizontally. This provides shots of varying depth and width over the court. These movements can be turned on individually or together, providing completely random play (variously referred to as Triple, 3D, All-Court or Player mode). The elevation control allows you to raise the angle of the throwing wheels so you can create lob style shots or anywhere in between. This can be used in conjunction with any pre-programmed drill or setting. The Spinfire’s 200-ball unibody hopper is quick to install when at the court and fits over the body when in storage. This larger capacity than most other machines allows you to practice hitting balls longer before you need to pick them up. This feature is not available in any other internally oscillating machine. On many ball machines the throwing wheels point to the last location they were at on start up. This requires you to manually center them yourself. Not with the Pro 2 as it automatically centers on start-up thus saving you time. So, all you need to do is to fire a couple balls to make sure you have aligned the machine properly along the centreline of the court and you are ready to start hitting. The Pro 2 recalls the last settings using for interval, speed, spin and elevation each time you turn on the machine. After spending time learning your favorite settings and inputting them into the machine, it is nice to know you do not have to re-enter them. The Pro 2 is designed to work with both pressureless Balls which save you money over the long run and maintain their consistency, regular pressurized tennis balls or even children’s tennis balls just not the red dot one as it is too large to fit through the throwing wheels. Our SetPoint Pulp Premium Pressureless Balls the the highest quality pressureless tennis balls available on the market today and exhibit a much longer life than regular pressurized balls.There are many cheap balls on the market that sell retail for less than it costs ours to make. They just don’t last. Although you can use any type of ball (other than the children’s red dot ball which is too large), the latter lose their pressure very quickly, especially in a ball machine as they get hit with much more frequency than when playing matches with a partner. Also, they then get squeezed through the throwing wheels each and very time they are shot. This can result in inconsistent ball throw and can occasionally result in the jamming of the throwing wheels inside the machine. 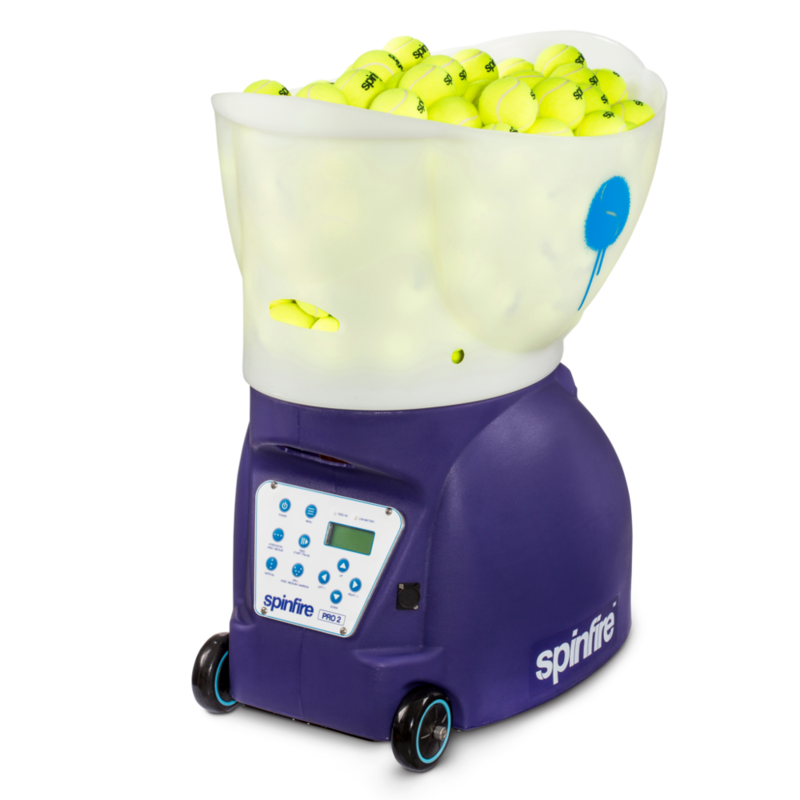 We find the majority of ball machine purchasers use our SetPoint Pulp Pressureless Tennis Balls to use with their Pro 2 but the choice is up to you. 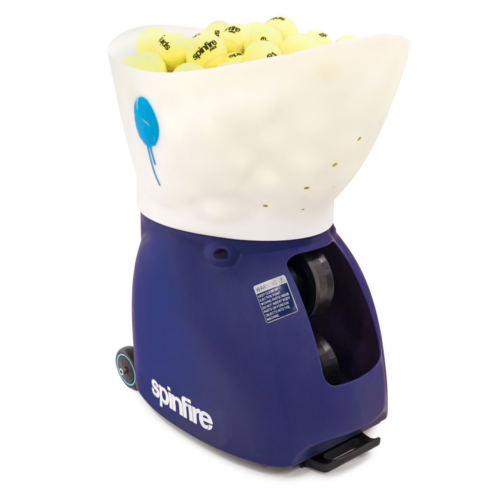 To take care of the situation where you forget to turn off the ball feeder while picking up balls because you think all the balls have dropped and then one that was stuck finally drops much later, the Spinfire has an exclusive safety feature not found in other machines. It will automatically pause the ball feeder if it has not detected a ball in about 30 seconds. It’s not fun getting hit in the head by a ball at 80mph! The 20Ah non-spillable SLA (sealed lead acid) battery provided with the Pro 2 will last from about 3 to 8 hours depending on the settings used. Note that unlike lithium batteries this SLA battery is rated to be able to be transported with your machine by plane. The Pro 2’s extreme grip counter-rotating throwing wheels are the most effective method of ball propulsion. This allows allows the machine to remain silent and effectively produce topspin and slice. No metal to rust or dent here, not to mention the ovoid-shaped body is a real beauty. It costs a lot more to make molds to create these so that is why many competitors skimp and produce cheap square bent metal bodies that can rust and dent. 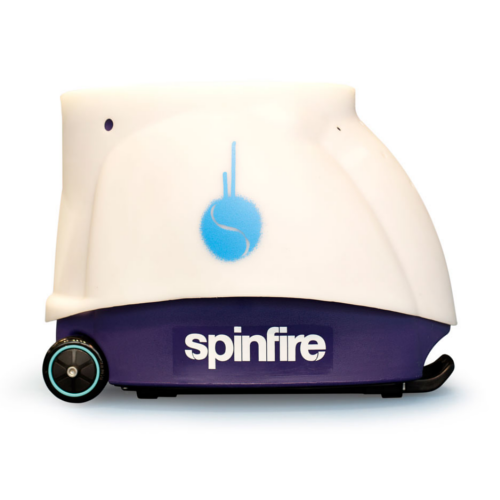 Spinfire’s objective is to produce premium quality machine that will last many years and not to cut corners. The magnetic horizontal sensor ensures even clay court dust will not hamper machine operation. Machines which use infrared sensors can get obscured by court dust and malfunction. The Pro 2 is one of the quietest machines available as a result of the fact that the throwing wheel mechanism is all internal. You and players on other courts will appreciate this. The Spinfire Pro 2 has an extensive list of diagnostic messages that will appear on the LCD display if there is an issue. They assist in pinpointing the exact issue your machine may exhibit. 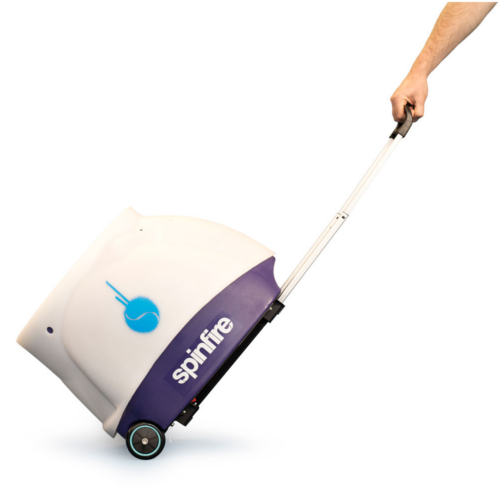 Spinfire has the most comprehensive suite of diagnostic messages of any machine on the market today. They assist in returning the machine to trouble-free operation. Padel, played on a smaller version of a tennis court, is gaining in popularity around the world and happens to be the 2nd most popular sport in Spain. Paddle Tennis is also played on a smaller court, similar to Pickleball, and is also gaining popularity world-wide and lends itself to winter playing. These sports are gaining in popularity worldwide as space becomes a premium and the average age of the population increases. Phone support is provided 10am-6pm Monday-Saturday EST. Emails are answered the same day, 365 days a year (366 if it’s a Leap Year!). That includes after-hours, Sundays and holidays. Our support is US-based, not from Asia like some competitors. Ball machines are expensive items so you deserve a high level of support. We have thousands of customers in the USA and it bothers us if even one machine is not working properly. No other brand even comes close. We provide a 2-Year Parts & Labor Warranty (battery – 6 months) and an optional 4-Year Warranty (does not extend battery warranty). We do not require you to send in a warranty validation card and the warranty starts from the date of receipt of your machine, not purchase. You have the option of shipping your machine to us or we can ship you the required part and provide you with videos and written instructions on how to replace it. Typically it takes no more than a philips screwdriver. We are also available on the phone and through Skype to guide you too. We do not build to order like some of our competitors but keep a healthy inventory so we almost always ship the same day if we receive your order before 1pm Eastern Time. The Spinfire Pro 2 has proven the test of time as it has now been on the market for 10 years and has received wide market acceptance in the over 50 countries around the world where it is sold. We offer a no questions asked ‘100% Satisfaction’ 30-day return policy which runs from the day you receive your machine. This allows you to call us by the 30th day to return for a refund, not like our competitors which only provide a 1 week, 2 week or one month return policy and then they actually have to receive it by the 30th day. All we ask is you call us by the 30th day to obtain an RMA and return the undamaged machine. Then you will receive a refund of 95% of the purchase price (excluding shipping). See our Terms & Conditions for complete information and requirements. The optional Carry Case also functions as a dust cover. It is made of rugged material and has handles by which you can lift the machine with one hand and a pocket for the manual. The Dust Cover protects the interior from dust and debris during storage. The machine can be rolled with either of these on the machine. Tennis ball machine review websites only list products sold on Amazon so they can get the commission when you click BUY. We can tell they have never even touched a ball machine. We only sell direct so they won’t list us. So, yes their ‘reviews’ are bogus. We don’t sell through dealers as they won’t stock, support or repair so why pay them if we do all the work! Instead we keep the price lower and invest in always being in stock, quick delivery and our industry leading product quality and customer support. If you want real advice call us for a strictly factual comparison. We actually own all the competitors’ machines so we know what we are talking about. Then you can decide for yourself.